Growing up in Africa, Kevin Bahati, now a first-year student at the University of Virginia, experienced first-hand the consequences of not having reliable access to clean water. Bahati said that where he grew up, the main source of water was from a borehole – a hole drilled through the earth to draw water from deep underground – and that waterborne diseases like typhoid and cholera were not uncommon. After coming to the United States in 2014 through a refugee program, Bahati graduated from high school in Houston. A friend he met there attended UVA, sparking Bahati’s interest in doing the same. “I always heard good things about UVA, and knew it was a good school,” said Bahati, who intends to study chemical engineering. 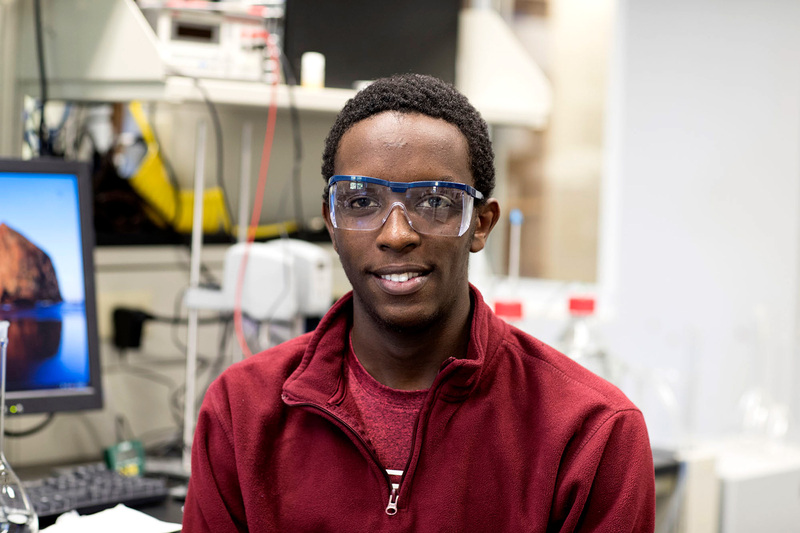 In just his first semester on Grounds, Bahati is already working toward his goal of improving conditions back home by working in chemical engineering Professor Geoffrey Geise’s water purification lab. Geise said he was captivated by Bahati’s background and experiences, and was eager to bring him on board. Bahati’s involvement in the lab is made possible through the USOAR program, which helps enable undergraduate students to get research experience early on in their college careers. In Geise’s lab, Bahati works alongside two other undergraduate students, four graduate students and a postdoctoral fellow. In addition to working in the lab, Bahati is a member of the National Society of Black Engineers and lives in the International Residential College. When he’s not devoting time to his studies, he plays soccer with his hallmates, works out and takes piano lessons. And though Bahati is still finding his way around Grounds, he already has a clear vision for the impact he hopes to make once he earns his degree.